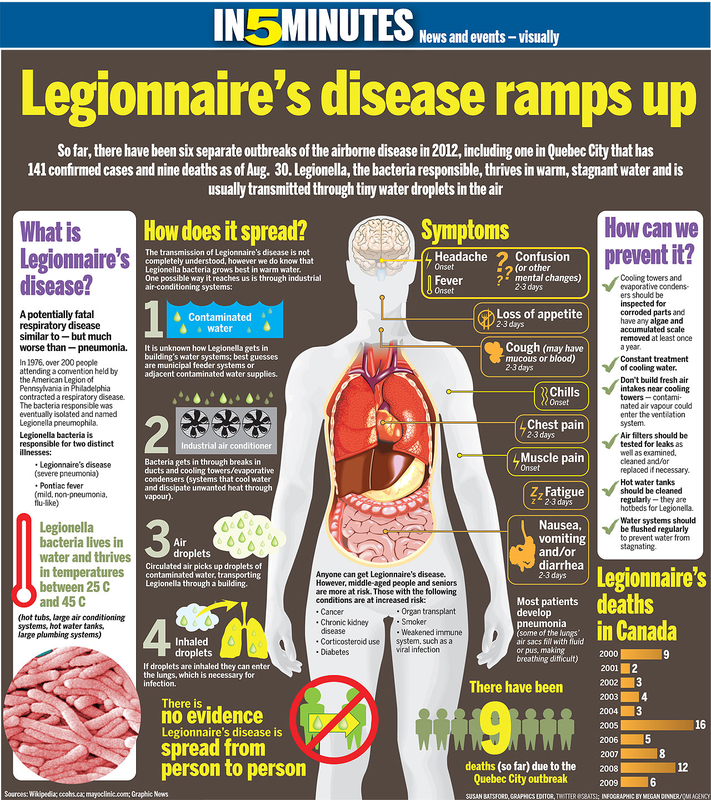 Legionnaire’s Disease is an acute bronchopneumonia produced by gram-negative bacillus,Legionella pneumophila. It derives its name and notoriety from the peculiar and highly publicized disease that struck 182 (29 of whom died) at an American Legion convention in Philadelphia in July 1976. It is caused by Legionella pneumophilla, which is an aerobic, gram-negative bacillus which flourishes on soils and transmitted airborne through cooling towers and air-conditioning systems. Immunocompromised patients or those with lymphoma or other disorders associated with delayed hypersensitivity. Patients with chronic underlying diseases, such as diabetes, chronic renal failure, or chronic obstructive pulmonary disease. It has an incubation period around 2 to 10 days. Definitive tests include direct immunofluorescence of respiratory tract secretions and tissue, culture of L. pneumophilia, and indirect fluorescent antibody testing of serum comparing acute samples with convalescent samples drawn at least 3 weeks later. A convalescent serum showing a fourfold or greater rise in antibody titer for Legionella confirms the diagnosis.